What Dental Health Issues Are Common in the Elderly? After years of having good oral health, seniors are sometimes surprised when a new round of dental issues accompanies the aging process. Treating dental health issues is always important, but it becomes a greater priority when you realize how much seniors need good oral health to be able to eat properly. 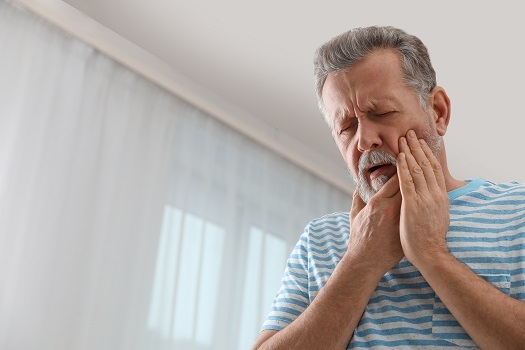 Watch out for these common dental health issues that tend to occur in the elderly so you can help your senior loved one get them under control. Your loved one may develop dry mouth if he or she takes certain medications or has a health condition that lists it as a symptom. While dry mouth is uncomfortable, it also wreaks havoc on oral health. For instance, a lack of saliva in the mouth means food residue is no longer rinsed away. Instead, it can sit on the teeth and lead to cavities. Talk to the dentist about medications your loved one takes and any symptoms of dry mouth he or she has regularly. Special rinses are available to restore moisture to the oral tissues, and your loved one may benefit from more frequent cleanings. Many younger adults have gum disease that’s still in the early stages. However, gum disease that isn’t controlled early in life often rears its head during the senior years. Make sure to help your loved one get to the dentist for regular cleanings and checkups. If your loved one needs a procedure such as a deep cleaning or gum grafting, provide support to help him or her recover properly afterward. For instance, your loved one may need someone to prepare a soft food diet until soreness goes away. Cavities can happen at any point in life. However, seniors with great teeth who suddenly develop many cavities could be facing challenges with their oral hygiene routines. For instance, having difficulty flossing due to arthritis in the hands could cause your loved one to get cavities between the teeth. Have the dentist assess how well your loved one can perform the steps of his or her oral hygiene routine. If necessary, try arranging for a caregiver to help out, and experiment with different strategies to reduce the risk of further tooth decay. A professional caregiver can be a great asset for seniors who need help with everyday tasks like brushing and flossing their teeth. Families who need help caring for a senior loved one can turn to Home Care Assistance, a leading provider of Oshkosh elder care. Services available in our customizable care plans include meal prep, mental and social stimulation, assistance with personal hygiene tasks, and much more. The oral cavity can also develop cancer, and the risk of this goes up with age. Your loved one needs to request an oral cancer screening during dental checkups. These screenings only take a few minutes, but they save lives through early detection and treatment. If your loved one is diagnosed with oral cancer or any other serious disease, compassionate help is just a phone call away. Living with a serious health condition can make it challenging for seniors to age in place. However, they can maintain a higher quality of life with the help of professional live-in care. Oshkosh seniors can benefit from assistance with meal prep, bathing, transportation to the doctor’s office, medication reminders, and much more. A single missing tooth can throw off your loved one’s bite. When your loved one is unable to chew food properly, he or she may develop secondary symptoms such as gastrointestinal discomfort or malnutrition. Help your loved one choose a tooth replacement option, and make sure to get his or her dentures checked and relined as needed so they don’t cause discomfort. Oral health plays a significant role in an aging adult’s overall wellbeing. Seniors who want to remain healthy as they age can benefit in a variety of ways when they receive professional at-home care. Oshkosh, WI, Home Care Assistance is here to help your loved one accomplish daily tasks, prevent illness, and focus on living a healthier and more fulfilling life. For reliable in-home care services, contact us at (920) 710-2273 today.